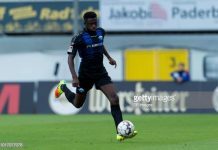 Updated football records have revealed that FC Mydtjylland of Denmark striker, Paul Ebere Onuchau’s wonder goal against Egypt on Tuesday is behind many others, in terms of the fastest goals scored in history, when the overall statistics over time are taken into account. 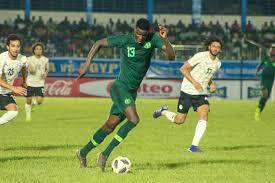 Footballlive.ng reports that, although Onuachu’s seven seconds effort at Stephen Keshi Stadium, Asaba, in terms of international matches, is only behind a six seconds effort by former Arsenal striker, Lukas Podolski for Germany against Ecuador in 2013, many others were hit faster at various other levels of the round leather game across the world. 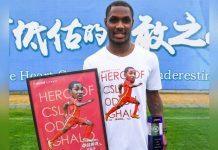 It is noteworthy, though, that Onuachu’s effort on Tuesday is the fastest goal in an international match involving two African national teams and second quickest overall in the continent, two seconds behind that by Club Africain’s Ghazi Ayadi, who struck on six seconds in a 2-1 win for his side versus CS Sfaxien at Stade Olympique, Radès on December 6, 2017. However, it is remarkable to note that there are several other goals that lie ahead of Onuachu and Podolski on the overall data of early sizzlers at various levels and venues of the round leather game over the years. 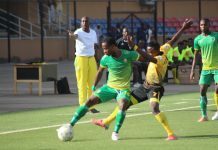 Sadly, many of the goals listed in the Guinness Book of World Records as some of the fasted in global soccer history were not on television nor filmed, thus preventing their precise timings from being assessed. Such is the status of Nawaf Al Abed’s goal in a match between Al-Hilal and Al-Shoala in 2009, which came in two seconds, but the match was later declared void due to ineligible participants, when several players over 23 years old were found to have played in the age restricted game. Similarly, Marc Burrows’ 2.56 seconds goal, in a match between Cowes Sports and Eastleigh reserves in 2004, has also been considered, but it was scored in an amateur game. Since there is no fixed size for a football pitch, some of the goals listed among the fastest benefit from being played on smaller pitches, in which the ball would travel a shorter distance before reaching the net. Nonetheless, other two second goals are from Andrew Alston, scored directly from kick off in the Gloucester District Sunday League Premier Division at Bishops College on 26 February 2017, and Gavin Stokes in a junior West of Scotland Super League First Division fixture. Also scored in two seconds are Vuk Bakic, in a 2012 junior match of the Serbian 2. League. Immediately after the referee whistled the beginning of action, Ricardo Olivera in 1998, and Cheung Sai Ho, who scored for the Hong Kong youth team 2.8 seconds during the Portsmouth Cup in 1993. Seven goals worldwide have been officially recorded to have been netted within three seconds, three in four seconds, seven within six seconds, among which are Podolski and Ayedi. 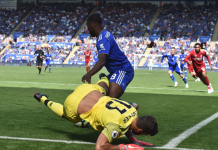 Ten have been enacted in seven seconds, now joined by Onuachu, while those in eight seconds, led by Tim Cahill and Christian Benteke, are nine.